designed for "nature's way of relaxing." A comfortable concept, this wood-slat folding porch chair followed the contour of a person's body, both sitting up and leaning back. Using orange crates to mock-up and refine their idea, they invented the reclining mechanism that would sweep the world off its feet. The first upholstered recliner came about in 1929, when a customer suggested that the cousins upholster their innovation and market it as a year-round piece. Good advice! It was the first chair of its kind and a bull's-eye target for industry thieves and copiers. So the company incorporated in April of 1929. Once again, friends and family came to the rescue raising $10,000 for patents and start-up production costs. The chair was an instant hit - but it needed a name. Combining promotion with necessity, the partners held a contest. The names people thought up! The Sit-N-Snooze. Slack-Back. Comfort Carrier. 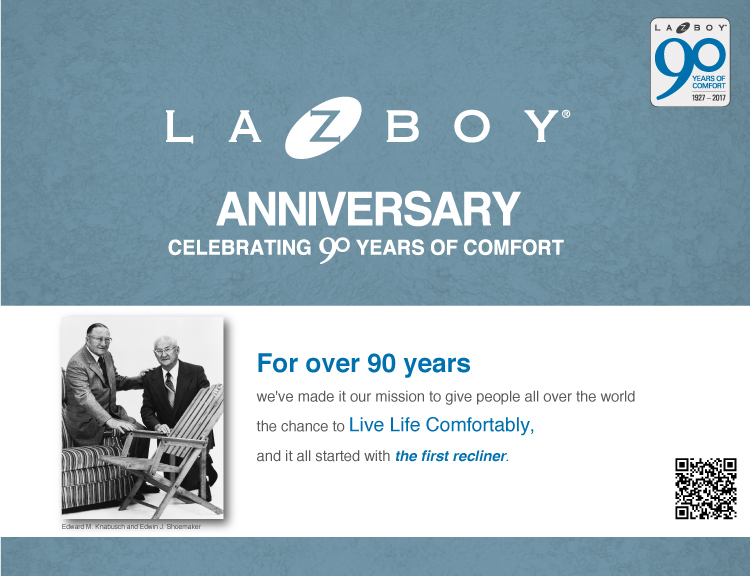 But one in particular - La-Z-Boy - was the winner. Black Tuesday and the stock market crash. The roaring nation started a slow dance to a very different tune. Money was tight for Edward ...Edwin ...Everybody. Fortunately, Floral City Furniture's reclining chair and reputation for quality craftsmanship caught on. Word was out. They were honest men and excellent woodworkers. A man once claimed that when he brought a mahogany side chair to the company to be reproduced by the dozens, he couldn't tell the intricate reproductions from the original. And though people in Monroe didn't have a lot, they always found ways to get the things they wanted. Customers would offer everything from wheat and coal to cows as payment for their furniture. There was even a pair of cackling guinea hens that, at the time, were more reliable than any space-age burglar alarm. By the end of The Depression, the Eds had collected quite a menagerie of farm animals. Pretty ironic in Edwin's case considering he went into furniture to get away from the farm. making twice the profits they were - the cousins converted the company into a retail store. They joined with the Michigan Chair Company in Grand Rapids to manufacture even more chairs. In a year's time, Floral City tripled in size and production space was increased to the second floor. Business picked up so rapidly that a circus tent to display furniture was pitched in front of the building. The cousins created a product and marketing strategy that drew people from Detroit and Toledo, as well as Monroe. These "Furniture Shows" fascinated families from miles around. While other companies' minds were on hard selling, Floral City concentrated on entertaining the then-worried public. While parents shopped, children watched acrobatic circus mice perform on teeter-totters, Ferris wheels and merry-go-rounds. Fish flipped and glided in a magnificent sculpted pond at the store's entryway. Shrubs grown by Edward and his wife, Henrietta, along with fruit from her garden, were given to prospective customers.